Your ten-day adventure through the southern half of the Northern Territory begins and ends in Alice Springs, a city rich in culture, art, and history. On the first half of the drive, you'll explore the East MacDonnell Ranges, where you can fossick for gems. Then you're off to the Glen Helen in the West MacDonnell Ranges, home of the impressive Glen Helen Gorge. Day three takes you to Watarrka National Park, famous for Kings Canyon and the beginning of the Red Centre region. Midway through your trip you'll spend a few days in the Uluru-Kata Tjuta National Park, where you will explore the iconic Ayers Rock (Uluru) and The Olgas (Kata Tjuta). Making your way back to Alice Springs, your journey takes you to one of the only Aboriginal-owned Roadhouses in Erldundo, and then back up to the West MacDonnell Ranges where you can explore the relaxing bicycle paths and picturesque swimming holes. Bon Voyage! The length of your drive to the East MacDonnell Ranges depends on where you plan to stay. This itinerary is based on your stay at the Gemtree Caravan Park, 140 km (about two hours) from Alice Springs via the Stuart and Plenty Highways. However, if you prefer to stay at the Ross River Resort, your drive would be about 85 km. Less visited than the West MacDonnell Ranges, the East MacDonnell Ranges are a camper's dream, with beautiful scenery, unique culture and history, and attractions that are fun for the whole family. 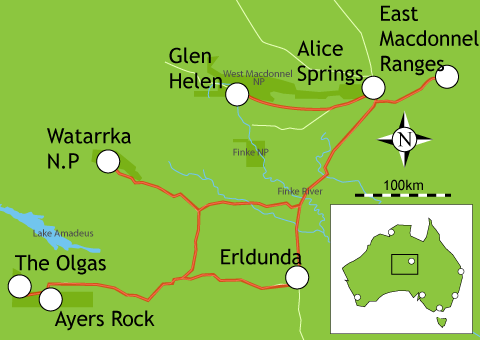 The eastern Ranges stretch more than 100 km east of Alice Springs, and are considered the Dreamtime birthplace by the Eastern Arrente people. Visit the ghost town at the Arltunga Historical Reserve, fossick for gems in the fields near Gemtree, and explore the natural beauty of Jessie and Emily Gap, and the Trephina Gorge. The scenery within the gorge is magnificent. Take one of the many marked hiking routes. The John Hayes Rock Hole is actually a chain of ponds within sheer quartzite cliffs. Take a dip, if you like. The road to Trephina Gorge is sealed, but one lane, so you must pull over to permit oncoming traffic to pass. Assuming you stayed at Gemtree, drive 273 km west (a little over three hours) via the Plenty and Stuart Highways and Namatjira Drive toward the West MacDonnell Ranges. One of only six permanent water holes along the historic Finke River, Glen Helen is situated at the far western end of the MacDonnell Ranges. Known for the nearby Glen Helen Gorge and the Glen Helen Nature Park, the area is rich in natural beauty and offers numerous opportunities for outdoor recreation. Whether viewed on foot as you walk the trails, or from above as you tour the area via helicopter, Glen Helen is a stop not to be missed. Located in West MacDonnell National Park, the Ormiston Gorge and Pound is known for its breathtaking scenery and series of walking trails, including the full-circuit, 7-km Ormiston Pound walk. Other popular walks include a 100-metre blindfold sensory walk, and the two-hour Ghost Gum Walk. Considered one of the most beautiful gorges in Central Australia, the Gorge impresses with sections that rise above 300 metres. Drive 260 km south (about three hours) to the beginning of the Uluru-Kata Tjuta region. (The trip could be longer depending on which road you take.) Home to the Luritja people for more than 20,000 years, the area around Watarrka National Park was first explored by a European in 1872. With sandstone formations dating back 360 million years, more than 600 species of flora and fauna, and 100-metre red rock above palm forests dubbed The Garden of Eden, this truly is one of the most spectacular environments on earth. If you are traveling with children or have limited mobility, take the moderate 2.6-km walk at Kathleen Springs. Signs along the path give you insight into Aboriginal life and the recent cattle industry; take a break at the waterhole at the head of Kathleen Gorge, were you will also find BBQs. Today, drive 304 km south and west (about four hours) to Ayers Rock. Located in the Uluru - Kata Tjuta National Park, Ayers Rock (Uluru) is one of the most iconic sites in Australia. Made of arkosic sandstone, Uluru is one of the largest monoliths in the world at 348 metres high and a circumference of over nine km. Extending six km into the ground, the formation of Uluru began 500 million years ago. Protected and managed by the Anangu Aboriginal people, Uluru is believed to be the sacred ancestral site where the world was formed. Located in the Voyages Ayers Rock Resort complex at the gateway to the Uluru - Kata Tjuta National Park, this resort campground features BBQ facilities, camper's kitchen, postal service, medical services, Internet access, laundry facilities, two full-sized tennis courts, swimming pool, jogging track, tour desk and information centre, shuttle service throughout the resort complex, live entertainment, self-guided walks to seven lookouts on the grounds, a shopping centre, and petrol station. The next leg aims to get you close to the Rainbow Valley Conservation Reserve, which has limited accommodations. Drive 266 km east (about 3 1/2 hours) via the Lasseter and Stuart Highways to Erldunda. Budget-minded travelers often choose to stay in Erldunda when visiting Ayers Rock and The Olgas, despite the drive. Drive 214 km north-west (about 2 1/5 hours) via the Stuart Highway, Larapinta Drive, and Namatjira Drive to the West MacDonnell Ranges. The remarkable natural landscape seems older than time, with deep gorges, unexpected swimming holes, ancient rivers, and giant cliffs. Stretching 400 km from east to west, there is no shortage of panoramic views or challenging bushwalks. Stay in Alice Springs, or nearby. Located about 4km from Alice Springs with great views of the MacDonnell Ranges, this park is the most awarded holiday park in the Northern Territory. Amenities include separate bathrooms for babies, adults, and disabled persons, mini mart with provisions, laundry facilities, tour booking service, camp kitchens, and wireless and Internet facilities. This sealed 17km bicycle path is a relaxing ride and introduction to the West MacDonnell Ranges. Panoramic views and 18 information signs enrich the experience. Near the end of the path, take a break from riding and learn about native plants on the Cassia Hill Walk. The path starts at grave of Reverend John Flynn, founder of the Flying Doctor Service and the Australian Inland Mission. A prime picnic location, the Ellery Creek Big Hole is your reward after a three-km Dolomite walk. Go for a swim and enjoy a snack or meal under the Ghost Gums. Located 90km west of Alice Springs, this site is considered a significant geological site on an international scale. Today, you will drive back to Alice Springs, which could be anywhere from seven to sixty km depending on where you are staying. Once merely an outpost in the Outback, which is now the old Telegraph Station, Alice Springs is now a thriving city with a rich cultural life. The capital of the Outback, Alice Springs is home to the Arrente Aboriginal people. Start your tour at ANZAC Hill, and shop and dine your way down, and then visit the RSL and War Museum. A host of other museums, shops, and experiences await you in this oasis in the desert!